It’s very easy to survive at my house – as long as you like leafy greens and healthy veggies! Making a colorful, delicious salad begins way before putting it all into a bowl. It begins at the grocery store. Shop the produce aisle for color. First, we begin with four types of lettuce. Many grocers sell a mixture of pre-washed baby greens of some sort (and sometimes more than one choice). Look through the leaves and notice the different shapes and colors. I counted three different greens in my salad mixture – two green leafy lettuces and one red. For extra crunch, I added a good bit of Romaine lettuce, too. Kale is always another option as your fourth leafy green. It is so healthy! Buy all organic if you can afford it. It doesn’t cost that much more, and it’s well worth the extra. Pesticides on regular veggies knock them out of the healthy foods category. Notice the different colors of lettuce peeking out from under all the veggies in my completed salad bowl. Yum! Next are a rainbow of veggies. 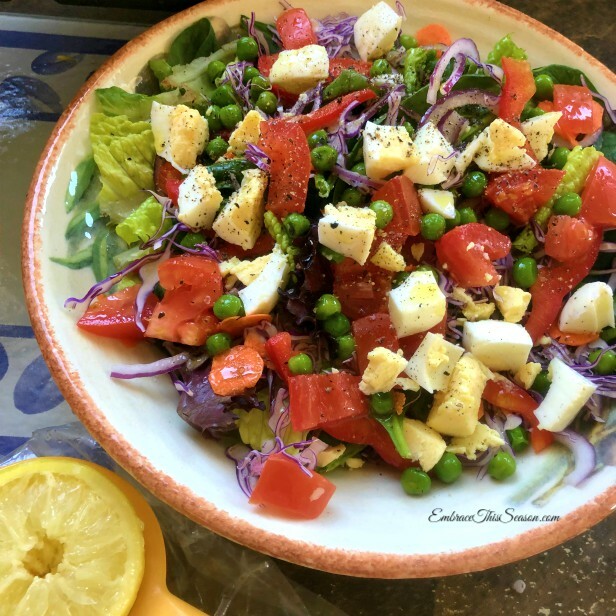 Red onions, purple cabbage, and anything purple in color – loaded with anti-oxidants. Bell peppers of any color (red, yellow, or orange are best), red tomatoes, cucumber, oranges, carrots, minced garlic, chopped raw yellow squash, zucchini and broccoli. The options are endless! 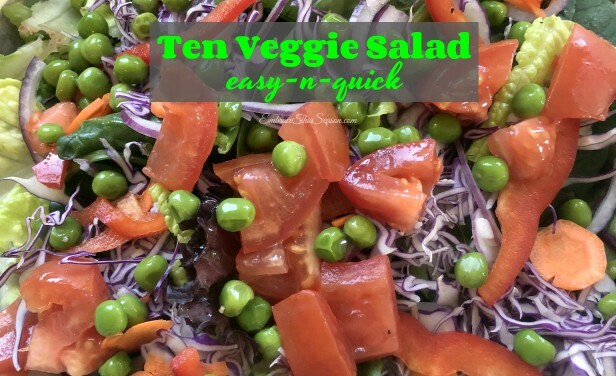 You can see how you could easily have a salad with 15 or more vegetables. Talk about full of health benefits! Black beans are nice in a salad. Pour them from the can, rinse them, and add a few over top. Frozen green peas, thawed and slightly warmed are a nice flavor boost, too. 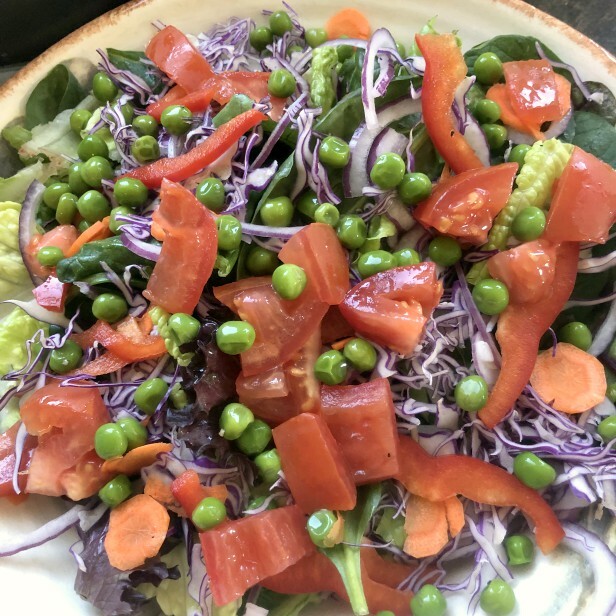 I chose green peas for my salad today. Think boiled eggs, toasted nuts, seeds, hemp hearts, goat feta cheese crumbles, chopped and cooked salmon or chicken pieces are all great protein additions. Choose what you like and make your salad sing! Add a splash of good quality olive oil, some fresh-squeezed lemon juice, S&P, and dig in! There you have it. Not too difficult, eh? 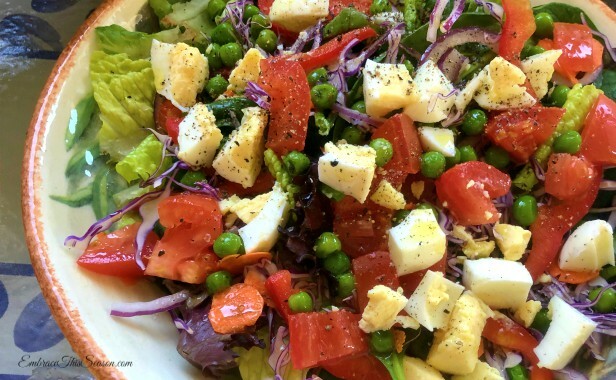 These salads come with an addiction warning. 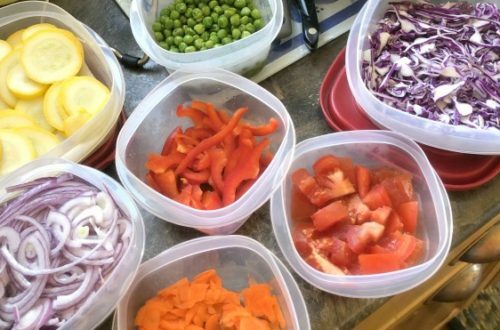 You’ll want a salad every day with all these options in your refrigerator. At least, I hope I’m not the only one! What are your favorite nuts or cheeses to include in your salads? Hi Kim, thanks for the info about the book and the BIG salad ing. It’s a good thing Larry likes salad so as to use up all of the veggies. He’ll really like this one. Kim, your salad looks delicious! I love walnuts or sliced almonds on mine. I don’t always put cheese but sometimes I put grated cheddar. I hope you enjoy the week end and church tomorrow.